Last night I watched the Stingers trounce the Copperheads at a baseball park that’s been in continuous use since the mid-1920s. The park’s in trouble, and while I can understand that it doesn’t hold the attraction it once did (the stands were maybe one-third full) it would be heartbreaking if they razed the structure as they apparently plan to do. There are few pleasures in life as enjoyable as watching minor league baseball at one of the human-scaled parks in which such teams play. It was steamy hot last night, but the cold beer helped. 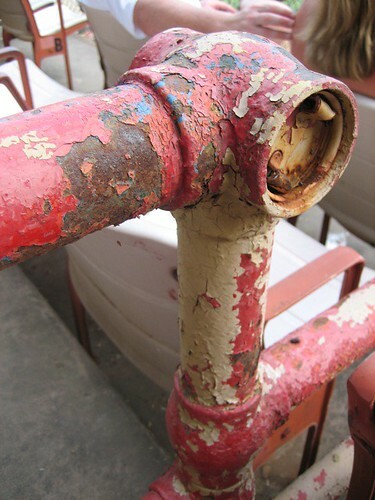 The picture above captures not only the park’s history evident in the many layers of paint, but also its current state of decay. More pictures are in this Flickr set. I just came across this site: http://www.SaveDuncanPark.org.